Of course, what the person really wanted to know was how he could exercise his creativity in order to better apply new insights and innovations to his life. Many people asked those same types of questions of the Disney Imagineers, who are known for creativity and showmanship. 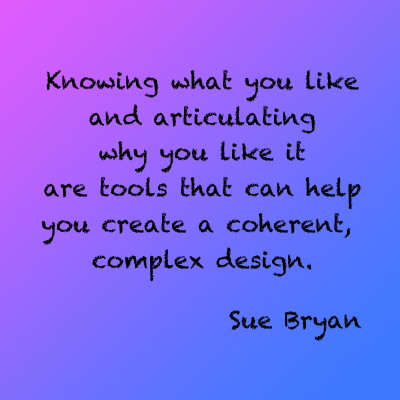 Sue sees herself as a design detective, always taking notes and capturing images for future reference. If it feels right, she keeps it to spark new ideas at a later date. Some of the steps of her process was published in The Imagineering Workout: Exercises to Shape Your Creative Muscles. Sue’s process is to assess her reaction of anything she observes for 5-10 minutes. It allows her to understand what aspect attracted her – Color, shape, sound, form, personality, habit… She continues the process by thinking about how she was engaged within the experience – Feeling, memories, details, use…. The exploration can include what makes us buy one product over another – Desire, expense, need, brand…. Sue also picks up on her negative emotions and responses. Knowing why we don’t like something can be very revealing of who we are and what contrast might inspire something great. After determining what turns her off, she looks for something she appreciates within the thing being observed. This helps her to find the thing that makes it cool in someone else’s eyes and drives her to figure out why. The amount of insights in others that we can gain by paying attention to the thing that makes something cool for someone else is priceless. Reviewing the why behind our own tastes can also help us refine our art for the express purpose of making it more universally acceptable, while maintaining its integrity. In every story I’ve written and every film I’ve shot, I can tell you my favorite scenes and the ones I wished had ended up on the cutting room floor. The more I review those positive elements and drop the things that cause me not to like something, the more widely accepted my stories become. Even speakers use this process, albeit subconsciously at times. Most speakers learn very quickly which jokes work and which ones don’t. The ones that work are kept and polished and the others are replaced. The more often a speaker gives a specific talk, the more impressive the presentation becomes. Please take some time today to analyze why you like something and try to determine what it is that sparks that feeling. I’d also encourage you to consider searching to find out what it is about something you don’t like. Then, see how your newfound views impact your life and work. Practicing creativity is the only way to stretch and increase your creative output.